War and combat were significant factors in the lives of all conditions of people during the twelfth and thirteenth centuries; thousands of men, women and children prepared for, engaged in and suffered from the consequences of almost endemic armed conflict. However, while war and combat feature prominently in many of the forms of literature written at the time, the theme of warfare in some types of narrative source remains a relatively under-studied area. This book offers an investigation of the depiction of warfare in contemporary writings, in both fictional narratives and factual accounts, aiming to bridge the gap between the disciplines of literature and military history. Using both established sources and the latest research, the author examines how the application of what is now known about the practical and technological aspects of medieval warfare can aid us in our understanding of literature. 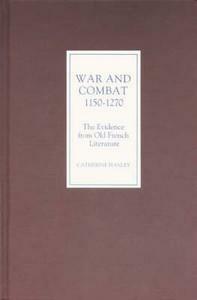 She also demonstrates, via an investigation of a corpus of Old French chronicles, epics and romances, how the judicious study of sources that are not always considered reliable can, in turn, inform us about contemporary perceptions of, and attitudes towards, war and other forms of armed combat.